Invisalign treatment is a modern solution for men and women seeking to improve the appearance and function of their smile. Unlike conventional braces that rely on wires and metal brackets, Invisalign uses sets of transparent, custom-made plastic aligners to slowly move teeth into the desired position. 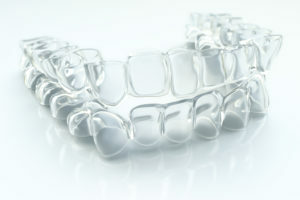 Invisalign users typically wear each set of aligners for 1 to 2 weeks before being exchanging them for the next set, as instructed by their dentist. Each new Invisalign set puts gentle pressure on specific points in the mouth to slowly shift teeth to match the aligner. While no two smiles are the same, Invisalign treatment on average lasts between 8 and 18 months, during which time patients should wear their aligners for at least 22 hours per day. Greater Comfort – Invisalign offers greater comfort than traditional bracket and wire braces, which can irritate soft tissue and cause tooth sensitivity. Removable – Invisalign trays are easily removed, so you can continue to eat, drink and brush your teeth like normal. Time-saving – Invisalign patients will need fewer appointments over the course of treatment compared to patients that must visit an orthodontist for bracket and wire adjustment appointments. In addition, the entire course of Invisalign treatment – typically 8 to 18 months – is significantly less than traditional braces. Aesthetically Superior – Invisalign aligners are nearly invisible to the naked eye, meaning that friends, co-workers and even family will likely not even notice when you are wearing them. All they will see is your beautiful smile! Although not generally recommended for younger children whose teeth are still growing, Invisalign clear braces can be the ideal solution to improve the smiles of both adults and teens. Fixing the imperfections in your smile no longer requires unappealing metal brackets in your mouth. Talk to a dentist in State College about how Invisalign can help you achieve the smile of your dreams without interrupting your daily life! Dr. Kevin Labosky has been serving State College patients of all ages with compassionate and quality dental care since 2004. For adults and teenagers who want to a straighter, healthier smile, Dr. Labosky and his team are qualified to provide Invisalign treatment. For more information, search for “dentist near me” to visit Dr. Labosky’s website or call the office at 814-237-7004.